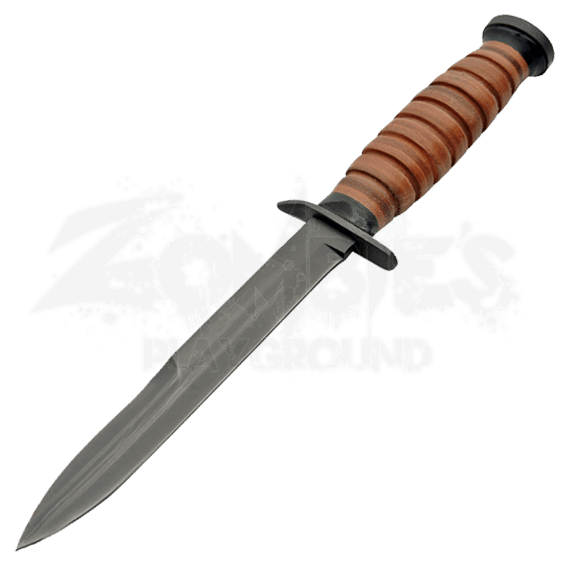 First issued in March of 1943, the WWII M3 Trench Knife was designed for elite forces that had need of a good close-quarters combat knife. This reproduction serves well in that same capacity, and it recreates the knifes form quite nicely, too. This knife features a blackened, stainless steel blade with a spear-point design, which maximizes its cutting ability with a full-length edge on one side and a partial, half-edge on the other. It also possesses great stabbing ability by aligning the point with the spine for the highest amount of strength possible. The knife features a stacked leather handle for a secure grip, and the guard has an angular bend which serves well as a thumb rest for comfort and for greater applications of force and leverage. Included with the knife is a hard, army green scabbard with a green belt loop attached for safe and easy carrying when the knife is not in use. Hardy, handy, and quick to deploy, this WWII M3 Trench Knife can be an absolute life-saver when it comes to survival situations.